The number of western made 1860's decade bitters bottles can almost be counted on both hands (aproximately 13 embossed on glass brands). Out of almost 100 brands manufactured for the western market, this is a pretty exclusive group. Most collectors would be pretty excited to have an example from this group. Of those 13 brands of bitters bottles, approximately 4 are known in a square shaped container. This Boerhaave's example is in company with the Rosenbaums Bitters, Alex Von Humboldts Bitters and the G. A. Simon's Bitters as the only square shaped bitters made during the 1860's, (there are of course the Dr. Renz's Bitters and the E. G. Lyon's bottle but these continued into the 1870's decade). Now that is an exclusive group! This particular example has some wonderful glass characteristics, the surface of the glass is whittled, which is not normally seen on these bottles, the old amber coloration varies in shades from the bottom half of the bottle being darker while the upper half is much lighter, with the neck and top being a darker shade again due to glass thickness. The embossing is quite bold, with the letters themselves being gloppy in appearance (my term used to describe the peaks and valleys of the letters due to the glass not forming evenly in the cavaties). There are currently 11 examples in western collections, 4 are a dark green coloration, 5 are various shades of amber, 1 is a light green color and 1 is a yellow olive coloration. The firm of Siegfried Wertheimber and Louis Waterman were the manufacturers and proprietors of this bitters. It was first advertised on March 7th, 1868 with the principle depot being at 311 Commercial St, San Francisco, by June of 1868 the firm was advertising this product from their 219 Commercial St, S. F. address. Dr. Boerhaave's Bitters was also being advertised thru the Portland Morning Oregonian newspaper from May 15th, 1868 thru January 28th, 1869, Millard and Van Schuyver were the agents for Oregon. 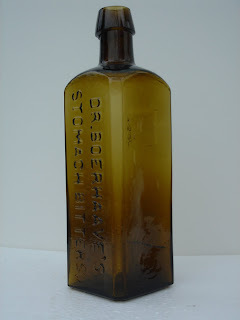 The Los Angeles Star newspaper ran an advertisement for the Boerhaave's Bitters placed by a local druggist for several mos. in 1868 as well. Wertheimber & Waterman also marketed a cordial called The Splendid and another bitters called Boonekamp and Maag-Bitters, these two products continued to be advertised without the Boerhaave's bitters throughout 1869 in a Sacramento newspaper. At the 1868 San Francisco Mechanics Institute Fair, Wertheimber & Waterman displayed two kegs of their Boonekamp and Maag-Bitters along with a case of their Dr. Boerhaave's Stomach Bitters.